Now I stablished on my website a safety way for paying my services via PayPAl. I finally finished my mobile version. From today on you can have a look at my short version of my website in mob form. Atapted for all type of mobile phones which have access o the internet. Back to Austria and back to work with great offers in Walking Tours through Salzburg and Private Tours with my brandnew luxery minivan for untill 08 passengers. Transfers from Austria to any destination and vc.vs. 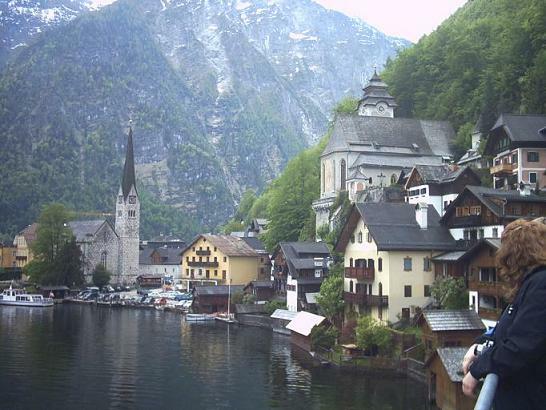 Private Tours through whole Europe including Austria. Guiding service for tourgroups in german, english, spanish, portuguese, french and italian. Special offer for Oberammergau 2010. Today is a very special holiday in Brazil. First of all april 21 st is celebrating the hereo of the independence of Brazil: Tiradentes But this year is even the 50th aniverary of Brasília, the capital of Brazil. The modern ciy of Jucelino Kubitschek and Oscar Niemeyer. Am 10.04 ab 21.00h steigt die nächste Brazil Party. Leider ohne mich, denn ich bleib noch bis zum 25.April in Brasilien. 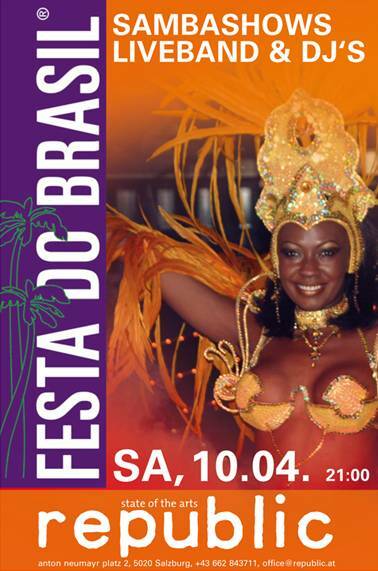 On april 10th at 9:00 p.m. happens the next brazil party at Republic Café in Salzburg. But this time without me, because I will be in Brazil untill april 25th. 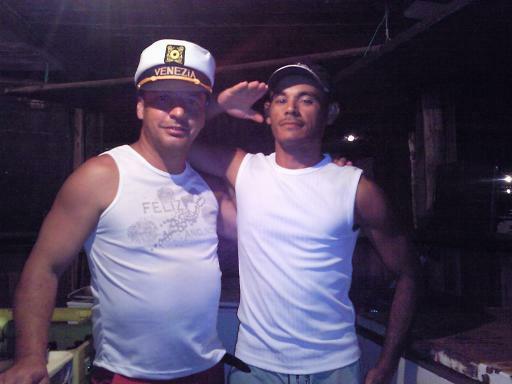 Get more information on Festa do Brasil. 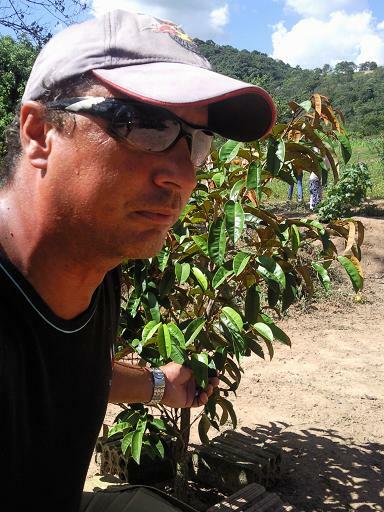 Here I am in front of a Mangostan tree at my aunt's farm in Minas Gerais - Brazil. 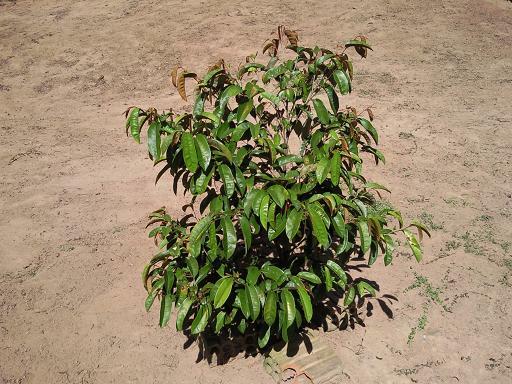 This is the basic fruit which gives the power of the multifunctional drink called Mangostan Gold. 260 Turtles where born today around 8 a.m. in front of our beachbar Barraca 7 irmãos at the beach of Farol de Itapoan. On the pictures I am holding two turtle babies in my hand. Because of a big quantity of algaes on the beach, we had to help them into the sea. 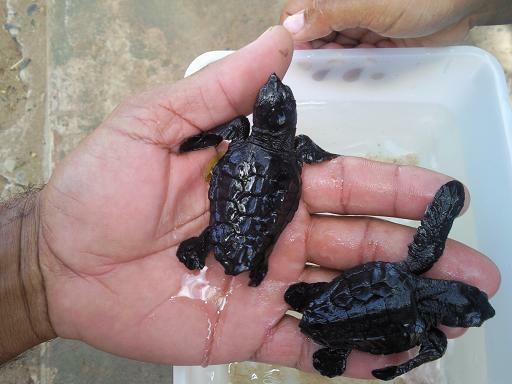 In Bahia there is an own project to rescue turtles which is called Projeto Tamar. 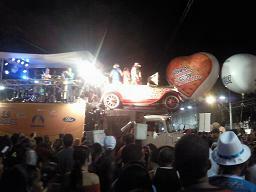 Carneval in Salvador da Bahia is the biggest popular Streetparty in the world. More then two million people from all over the world are dancing, singing and loosing a lot of weight during 6 days and 5 nights. 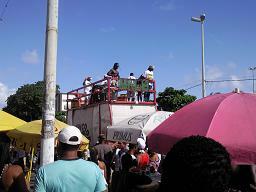 The bands are playing from trucks called "Trio elétrico". This year Salvador is celebrating 60 years of "Trio eléctrico" invented by "Dodô e Osmar". Itapoan is a district in the north of Salvador. It is sometimes written like Itapuã. This is an indian word from Tupí-Guaraní and means "Point of the rock" or like the people are saying "Snoring rock". The rock is the last rock you can see on the beach of Itapoan. On the streets happens the big party. 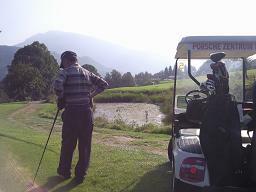 See videos on Lavagem de Itapoan. This popular Party celebrates the godess of the sea called Yemanjá. 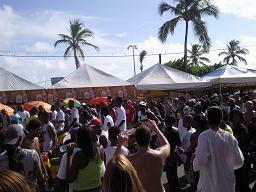 The Party happens every year at february 2th at the beach called Paciência at Rio Vermelho in Salvador. Here you can see the Procession and learn about the godess Yemanjá. 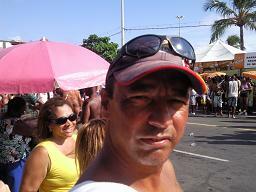 Before carnival happens in Salvador several big celebrations like the Prozession of Bonfim. It is a pilgrim walk from about 6 miles leaving from the church Saint Mary Conception of the beach untill the Basilica Bonfim. The ladies in white are called Baianas and they are washing and cleaning the steps of the the church. Followed by thousand of people with music and happyness. 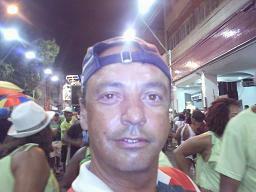 Look at the videos on the following link Lavagem do Bonfim. From now on you can ski in Obertauern - Salzburg Land. It is around 01 hour drive from Salzburg Airport to Obertauern. 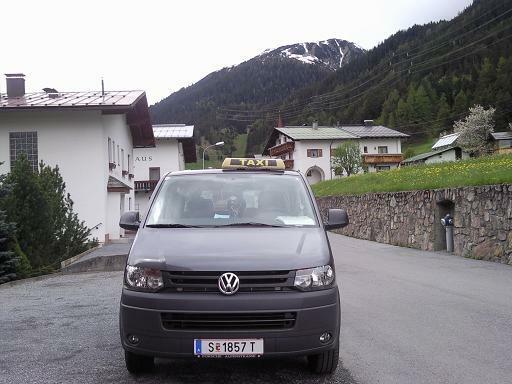 If you need to book a Taxi or a Van to Obertauern you can have a look at my site Austriatransfers. You can do with Manfred, Director of MCM Tours - Skitours with a professional Tourguide and Ski Instructor. The Salzburg Christmas Market is open since today. The main market happens in the city center around the Residence Square. Here you find even Ice skating at Mozartsquare. There are more Christmasmarkets in Salzburg such as in front of Salzburgs Main Trainstation, at the Fortress Hohensalzburg and in the courtyard of the Restaurant Sternbräu. My favorite market happens only from Thursday to Sunday at the Palace Hellbrunn. 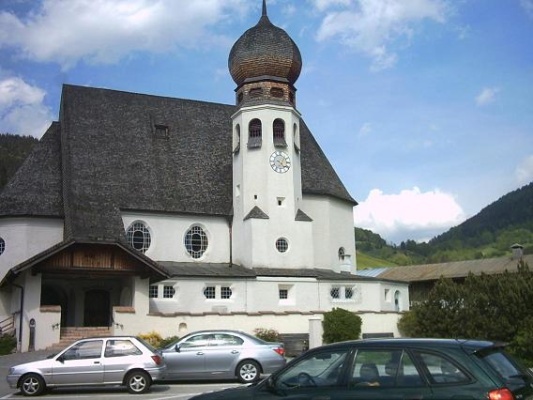 A very nice Tour to the Christmasmarkets of Wolfgangseer Advent is to go to St. Wolfgang on a Halfday Tour passing St. Gilgen and Strobl by doing the boatride on the Lake Wolfgangsee. At 01:30 p.m. Tom Cruise landing at Salzburg Airport. He will stay a while in Salzburg being main actor together with Camaron Diaz in "Knight & Day". 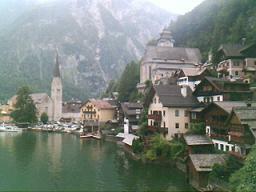 The movie will use locations in the city of Salzburg as well as in the suroundings. And who knows - We might invent the Knight and Day Tour in Salzburg. But lets see in July next year, how many minutes Salzburg will appear in the movie. This evening I was meeting my german Partner Jens from Magostan-Gold Europa Team. Talking about the sucsess of this revoulutionary drink which contains figcactus Opunzia, Lycopene, Acerola Cherry, Sea minerals, and Mangosteen – the Queen of all Fruits!! To order just go to Mangostan-Gold. This was a great party with Edison Tadeu in Salzburg. We danced the whole night to his hot rythm. The party was organized by Andreas from Hotel Hohenstauffen and with the help of the Restaurant Zum Hirschen Oliver and his charming wife maid us an unforgettable evening. See perfomance from Edison Tadeu with Shakira, Supermax and other musicians on youtube. The most expensive beer I had this year in Venice. Lupo is an Austrian artist who I met in Brazil. We were doing different projects together and now we are trying to help each other in business as well as connections that we both have. For me he is one of the best portrait Painters of Austria. On my site Lupo - Wolfgang Berhard you will find a little part of his work and his personal contact. “History meets Future” is the motto of the 200-year anniversary celebration in Innsbruck. Here I am in front of the Royal Palace the Hofburg. Closed to me Mr. President of Austria Heinz Fischer, the Mr. Chancelar Werner Faymann and inbetween us 25.000 Tiroleans from North, East and South Tirol in their traditional clothes representing the resistance against Napoleon troops. I do the fullday tour from Salzburg to Innsbruck. Incl. Citywalk and Panorama tour. See at Salzburg Tours. Winter Wonder Land in Salzburg. 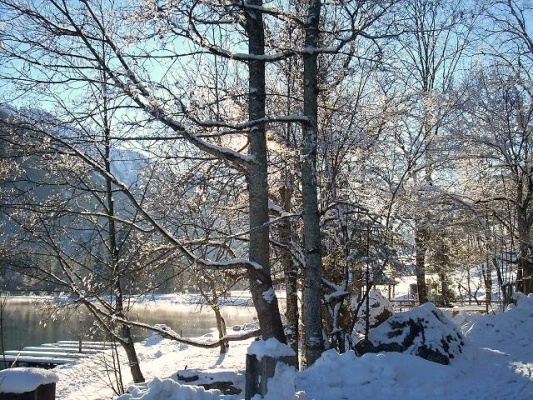 Nothing more romantic then a tour through snow covered forrests, fields and lovely trails on a Horse Sleigh. And for antifreezing we stop for Glühwein and Schnaps. 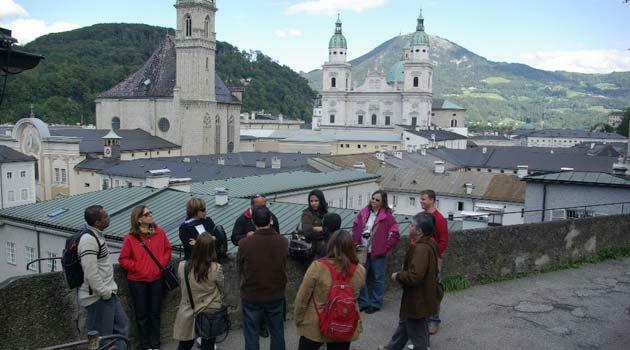 If you would like to do this tour then just go to my tour offer at Salzburg Tours. Transfers to Skiresorts in the deep Winter 2009. Here I am on the way back from Kitzbühel to Salzburg Airport. These conditions are only for good drivers and best tires. Often I need to put chaines on them to continue driving. If you wan to book the transfer go to my site Austriatransfers. There are enough Taxis at the Airport Salzburg. Big ones and small ones. See the video on youtube: Taxis at the Airport Salzburg. But if you prefer to book your taxi in advance then go to my site Taxi Transfer to the Skiresorts - Transfer Vacation Salzburg. A Happy New Year full of Peace, Love and Health to everyone!! !